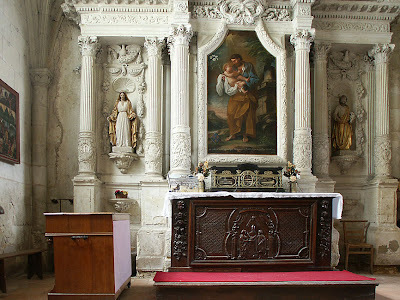 This is not the abbey, but the parish church in the town of Fontevraud l'Abbaye. 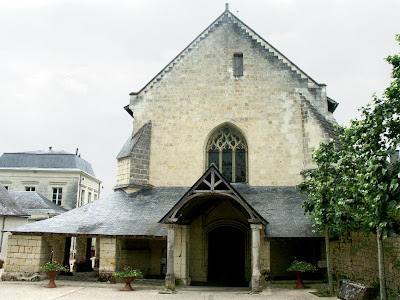 The church of Saint Michel was built in about 1170 at the request of the abbess Audeburge of Fontevraud Abbey and built (or ar least paid for in part) by Henry II and his wife, Eleanor of Aquitaine. There are two heads carved into the vault of the choir near a rib which could be their likenesses. We haven't noticed these, even though I have taken a photo of them, so next time (and there is sure to be a next time) we are there we will report back. This photo has a couple of interesting features: the heads which are supposedly those of Henry and Eleanor; and the blocked windows over the altar, which have subsequently plastered over and the whole wall painted to look like cut stone. The church was expanded in the fifteenth and seventeenth centuries, but the Romanesque core of the building is still evident - the blocked up rounded windows in the above photo, for instance, and the generally half rounded rather than pointed arches. I don't know if the low porch all around the building as shown in the top photo is unique (or even particularly romanesque), but I do really like it. where they were erected in 1621.
but I suspect it was also from the abbey. 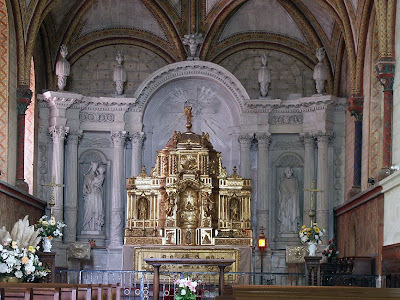 I also enjoy discovering what the French call "patrimoine";old buildings,churchs & the like. Did you have to "borrow" the key to get inside the church ? Where you are living, a lot of the churches are locked up when theres no mass ! My hubby & I have only made it inside 2 or 3 churches around Preuilly. 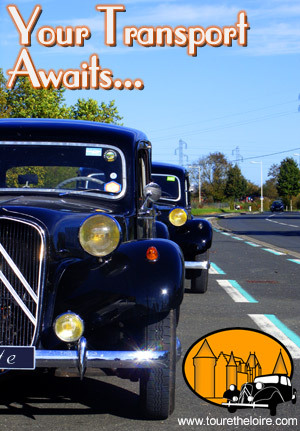 Luckily, we have not run into the locked church thing yet(in France, anyway). This can alarming, as we have been in churches that have their silverware on display, just sitting on the altar! So we are learning a lot about Fontevraud this month. Walt with his abbey and today about the church. The altars look great. I thought that might happen with the link. 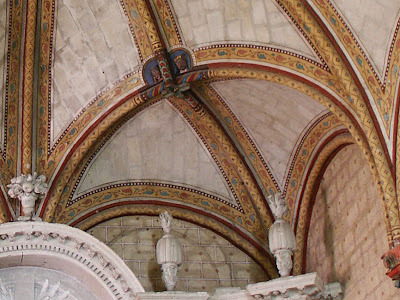 Instead of linking to a specific post, I linked to search results that should return all blog entries that mention Fontevraud. A few years back, when I went to Fontevraud with Ken and Walt, I remember seeing this church since we were parked close by. Psssst.... wanna buy a truck?